On Thursday, MC Power held a dedication ceremony for their 23 acre solar farm facility on the south east corner of town on 3rd Street. The new facility has 9,720 solar panels and produces 3.25 megawatts of d.c. power. It has four inverters, a transformer, and uses an estimated 31 miles of wiring to bring the power to the distribution system, that will power an average of 350-400 homes in Chillicothe, per year. Financed by Gardner capital, MC Power Company will own, operate, and maintain the facility that holds solar panels that cover 16 acres. Tom Hardwick, VP of Business Development for MC Power, praised Livingston County and City of Chillicothe officials for working together to make building the facility possible. "Wow," said Hardwick, "what a relationship the county has with the city." John Twitty of Gardner Capital Inc., called it "a fabulous partnership." "Those kind of things just don't happen," said Twitty. "They happen because good people reach out to one another and they try to do the right thing. This is obviously the right thing." That partnership extends between the various companies that had to work together to make the project work. Gardner Capital financed the project, MC Power will manage the facility, distribution will still be handled by Chillicothe Municipal Utilities, and the facility is a part of Missouri Public Utility Alliance. Providing renewable energy sources is a statewide commitment, and MC Power now has seven solar facilities in Missouri, with four more that are currently being built. As part of their community outreach, MC Power also made a donation to Main Street Chillicothe to support continuous downtown development projects. MC Power Companies has a 25-year contract with Livingston County. A groundbreaking ceremony for a solar farm in the southeast part of Chillicothe just outside the city limits, took place at 10 a.m. Tuesday, April 25, at 366 East Third Street. 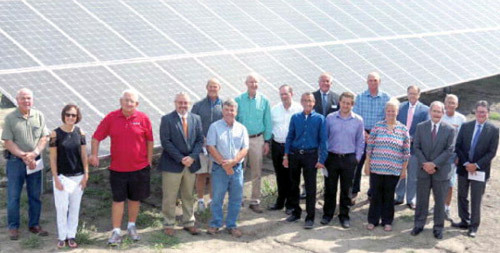 The event was coordinated by MC Power Companies in conjunction with the city of Chillicothe, Chillicothe Municipal Utilities, Livingston County, Missouri Public Utility Alliance, and Gardner Capital, Inc.
Electricity from the farm will go into the CMU electric distribution system, according to CMU General Manager Jim Gillilan. MC Power Company officials estimate that the solar farm will generate enough electricity in a year's time to power 300 average-size homes. The solar farm is located south of East Third Street and east of Mitchell Avenue.